Growing up in Maryland, I never gave much thought to people who were Loyalists during the American Revolution. When I was in elementary school, I learned that Patriots were good/right, and Loyalists were bad/wrong. Visits to Colonial Williamsburg provided lots of insights into the former. So did the historical novels I remember reading—all the protagonists were Patriots. Set near present-day Fayetteville, NC, in 1775-76. 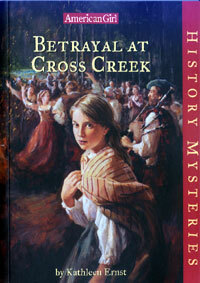 Decades later, I wrote Betrayal at Cross Creek. The young protagonist and her family, recently arrived Scottish immigrants, faced painful choices in colonial North Carolina. Many of the Scottish immigrants had already fought against the British king, and lost; they suffered terribly because of that. They reached North Carolina in the middle of the Revolutionary War, and were pressured by both sides. There were no easy choices. Some ultimately moved again, and ended up in Canada. I just finished reading The Hungry Year, by Connie Brummel Crook. Aimed at a middle-grade audience, it gives young readers a good glimpse of the hardships many Loyalists experienced after leaving the new United States. The winter of 1787-1788 was particularly brutal for the new arrivals. The book was one of many suggested by a librarian in Amherstview, near a delightful historic home in Ontario. I almost stumbled over this gem during a trip to Ontario last summer. Fairfield House is one of the few 18th-century Loyalist homes remaining in the province. Abigail and William Fairfield arrived in 1784, among the first Loyalists to settle in the area after the American Revolution. The home remained in the family for six generations, until it was donated to the Province in 1959. Except for the porch and verandah, which were added later, the house looks as it did in 1793. The house sits on the shore of Lake Ontario. Abigail and William Fairfield had created a farm in Vermont in the 1760s. After Patriots threatened his safety, William escaped to Canada in 1778, and served as a volunteer throughout the war. Abigail stayed on the Vermont farm, alone with her seven children, for another year before fleeing to Canada. For about four years, Abigail and the children lived in the refugee camp at Machiche, likely sharing a small cabin with another family. When considering options for presenting any historic home to the public, curators often decide to pick a date of significance, and to look for furnishing to support that restoration period. The Fairfield Homestead Heritage Association, which oversees programming, museum services, and preservation, made a different decision. The only things left inside are items that belonged to the original family. The limited artifacts leave a lot of empty space, but that decision gives visitors a chance to see the bones of the house. Instead of becoming a backdrop, the house tells its own story. I had the chance to learn about period construction methods, and to touch the marks made by–as the guide said–Loyalist axes. It’s not often I get to explore cellars and attics while touring historic homes. 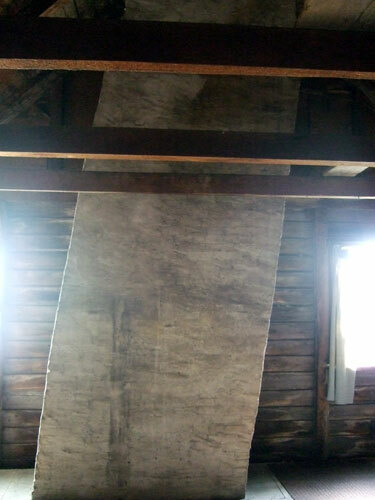 The photo below shows the chimney as it passes through the attic. Why is is slanting? Evidently the family wanted the fireplace located in the back of the house, but still wanted to maintain the graceful external symmetry common in contemporary architecture. 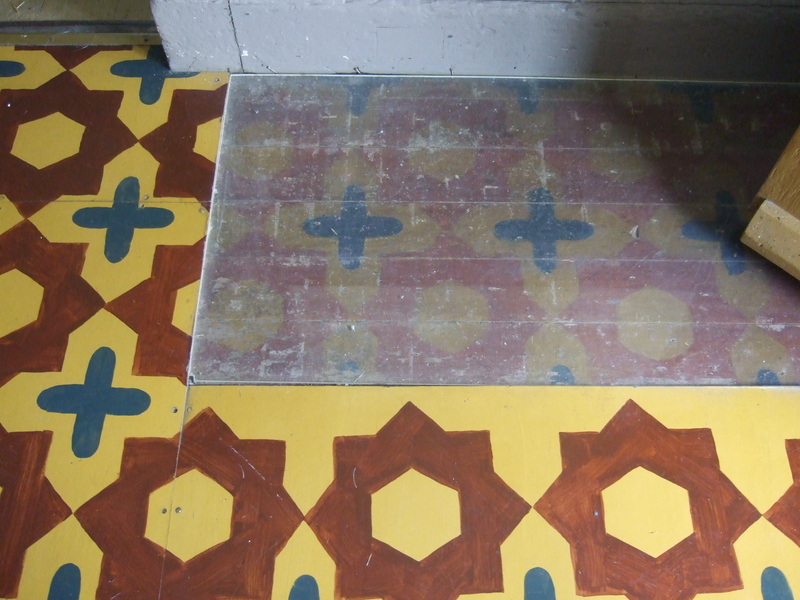 This photo shows a protected bit of the original design painted on the entryway floor in the 1800s. The design was reproduced in the area where visitors walk. The minimalist interpretation gave me lots of room to think and reflect. After taking the tour, I wandered to the shore to sit and imagine the area in 1793. I wondered if Abigail’s relationship with William changed during those years when she was largely left on her own. I wondered if she dreamed of such a large, fine home during those years when she shared a refugee cabin with her brood and another family. I wondered if she was ultimately satisfied with the move, or if she always missed Vermont. Perhaps she sometimes sat at this very spot, and thought about the same things.